Deer ticks and dog ticks are tiny bugs most likely found in shady, damp, brushy, wooded, or grassy areas...even your own backyard. If a human gets bitten by a tick, it can spread diseases like Lyme disease, Tularemia, and Rocky Mountain spotted fever. Mosquitoes can transmit germs when they bite. In Massachusetts, the diseases linked to mosquitoes are West Nile virus (WNV) and eastern equine encephalitis (EEE) virus. You are the best form of prevention against possible mosquito and mick-borne diseases. For more information and updates, please click on the provided links to the Massachusetts Department of Public Health website, or call the Gloucester Health Department at 978-325-5266. 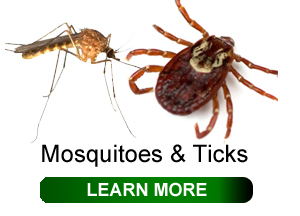 For more information on Ticks and Mosquitoes click here.